Built in America. Made in the USA. 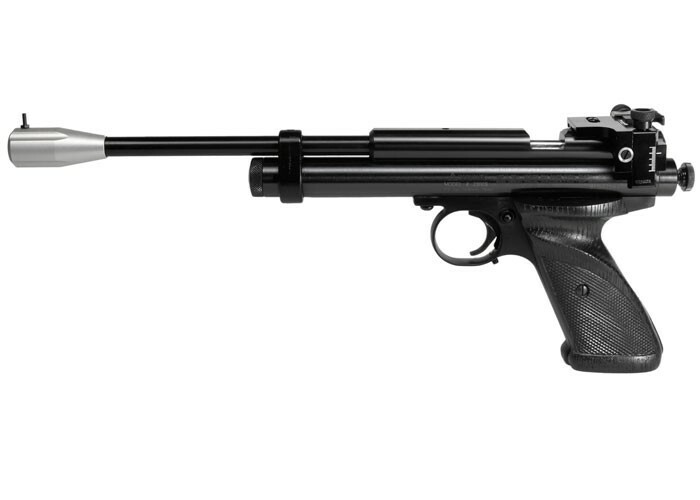 Instead of putting their own barrel on the gun, Crosman put a choked Lothar Walther on it. If you want to win matches, you have to use the best there is, and Lothar Walther is it! 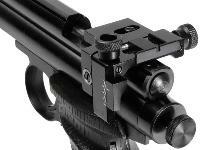 The 2300S has a post front sight, which sits atop an aluminum muzzle weight. 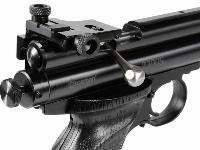 The rear Williams sight is an airgunner's dream come true. 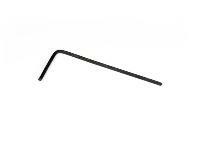 The crisp detent stops on this all-metal sight let you home in on your target so exactly that others will be amazed at your new-found shooting skills. 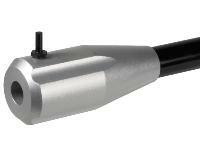 The single-stage trigger is adjustable down to 1 lb., plus it has an over-travel screw. There's a thumbrest on each side of the synthetic grips. For even greater control, the 2300S has two power levels. High is about 520 fps, low is about 440. You'll get over 60 shots with consistent velocity from each 12-gram CO2 cartridge. Things I liked: I really like the sights on this pistol. It is used for IHMSA competition and quality sights are very important. Things I would have changed: It would be nice to have a selection of different grips available. But, I realize at this price point, not all options can be done. What others should know: If you are considering a CO2 pistol I feel this one is a very good place to start. Things I would have changed: Loading the pellet is sometimes difficult but the greatness of this gun outweighs any negative. Things I liked: Well balanced and accurate. It feels like a natural extension of your arm and points well. 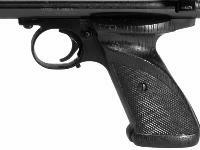 It is constructed very well and lacks plastic features normally found on guns of this price range. Things I would have changed: Only two things come to mind. One, I would like to see a trigger spring not as stiff as the one provided. When adjusted as per manuals instruction the best I was able to accomplish was three pounds of trigger pull, not the one to four pounds listed. Compression of the spring does not work so you either need to upgrade the spring or cut a link from the spring. Two, would be the Williams sight included. No matter what I tried the sight has a slight tilt to the left. It does not affect accuracy, it's only aestetic. What others should know: For those who like to "dress up" their pistol there are numerous resources that allow you to do just that. 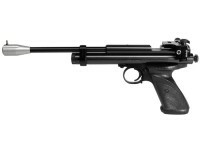 It is totally possible to shoot one hole groups with this pistol. 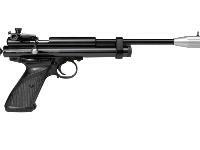 Crosman charges less then $50.00 for what? I think you have this confused with the 2240 which is a co2 pistol. Is there a .22 cal. in ths model? Check with the crosman custom shop , they do have 22 caliber barrels.